Savor the many sunny delights in South Padre Island and stay at Ramada Hotel and Suites South Padre Island hotel. 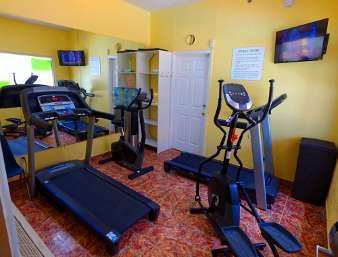 With a prime location on State Park Road and mere minutes from the glorious sandy beaches of South Padre Island, Texas, this seaside lodging facility is a great vacation spot for families and romantic getaways alike. Amenities include private beach access, sparkling outdoor pool, soothing hot tub as well as a basketball court and putting green. Sundecks proffer scenic views of the ocean, while complimentary wireless internet, ample large vehicle parking, meeting facilities and lobby business center are available for meetings and special events. Ample aquatic activities are within easy reach including windsurfing, kiteboarding, fishing, jet-skiing, dolphin watching as well as golfing and nature trails. Guestrooms come equipped with microwave and refrigerator, and family suites are available. Pets are welcome for a nominal fee.